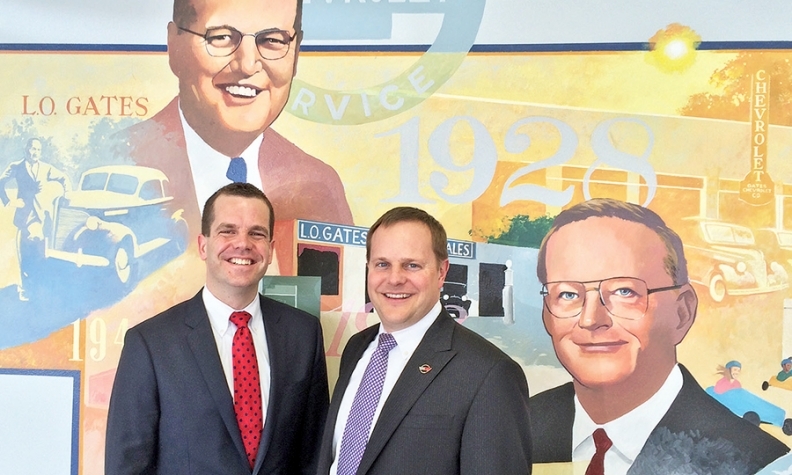 Joel Gates, left, and Matt Helmkamp have boosted Gates Automotive Group's used-vehicle volume to meet demand. Family before them focused on consolidation and diversification. In 87 years as northern Indiana auto dealers, the Gates family has learned that each generation needs its own business plan. The 5th generation is adding more repairs and used sales but keeping friendly service and low prices. SOUTH BEND, Ind. -- If the Gates family has learned anything in 87 years of operating dealerships, it's that each generation must forge its own business plan. In May, when 21-year-old Mitchel Helm-kamp starts selling cars during his college summer break, he'll be the first of the sixth generation in harness. And whether he sells for dad Matt Helmkamp at Gates Chevy World in Mishawaka, Ind., or for Joel Gates, another relative, at Gates Toyota here, he's got some history to absorb. In 1928, founder L.O. Gates jumped from Ford to Chevrolet and soon had seven stores sprawled across northern Indiana. His son, Van, consolidated, focusing on two locations. In 1982, Van's sons, Larry and Bill, diversified by adding Toyota. Since 2011, Bill's son Joel Gates and Larry's son-in-law Matt Helmkamp have sharply boosted used volume and added used-only lots to meet growing demand for inexpensive but dependable commuters. Gates and Helmkamp have 10 children between them, the youngest age 6. Mitchel Helmkamp is the first to work as an adult. That makes the Gates saga a six-generation tale. Founder L.O. recruited his dad, Burr Gates, to organize weekly trips of locals to pick up new cars at the factory in Flint, Mich., and drive them to the dealership. Two threads run through Gates history: Adapt to win new customers, but cling to what keeps customers -- service, low prices and friendliness. "We want to take such good care of our customers that we can turn them over to another generation of family," Matt Helm-kamp says. Before opening his Chevy store in 1928, L.O. Gates was an ambitious schoolteacher in Hamilton, Ind., who moonlighted with a rural postal route and as a door-to-door Fuller Brush man. He sold Fords in the mid-1920s as a subdealer with a one-car showroom-repair shop in Hamilton. In 1927, when he couldn't get any cars as Ford retooled for the Model A, he helped out at a friend's Chevy store. Forced to pick sides after a Ford manager caught him driving a Chevy to a Ford zone meeting, L.O. chose Chevrolet and soon opened his store in Plymouth, Ind. As Van Gates wrote in a 2003 memoir: "In those days, you were either a Ford man or a Chevy man." South Bend always has been a transportation hub. A century ago, Studebaker and Simplex were crosstown rival automakers. The Studebaker plant closed in 1963, but in adjacent Mishawaka, the AM General plant, which once built Hummers and military Humvees, assembles MV-1 taxis and starts making the Mercedes R class this summer. The U.S. RV industry is centered in Elkhart, 15 miles east. But autos are just the new stuff in South Bend. It was a hub before America had roads, the gateway from the Great Lakes and Atlantic to the Mississippi and Gulf of Mexico. For centuries, Potawatomi and Miami tribes knew that at the south bend of the St. Joseph River upstream from Lake Michigan began a 4-mile portage across flat ground to the Kankakee, the Illinois and the Mississippi rivers. Once the tribes showed the area to French explorers La Salle and Marquette in the 1670s, South Bend's first trading post soon followed. From the doors of Gates Downtown South Bend, which now sells only used vehicles, you can glimpse South Bend's history. The Studebaker plant is three blocks south, the original portage path is northwest. Gates Toyota is close by in South Bend, Gates Chevy World is in Mishawaka to the east, and the Gates of Granger used-vehicle store that opened in 2013 is in nearby Granger. Memories run deep in South Bend. It's not quite urbanized, just outside Chicago commuting distance. It's not quite rural, though prosperous-looking farms surround it. After Studebaker closed in 1963, the city lost 30,000 residents. The largest local employer now is the University of Notre Dame. But the surrounding area is stable. Families tend to stay in St. Joseph County generation after generation, says Joel Gates, 32. It's long past the late 1930s, when the first local radio jingle proclaimed, "L.O. Gates is the man to know" on WSBT-AM. "We still get customers writing out checks to 'L.O. Gates,'" Joel says. The current Gates formula starts with tradition. "Our marketing edge is 85 years in this community," says Clint Emberton, Gates' general sales manager for all four locations. "We market the Gates brand. Integrity and character runs so deep in this family. That has been the cornerstone." Most auto sales come from repeat customers or referrals, Joel Gates says. But to grow after weathering the recession, the Gateses needed new customers. So when partners Joel and Matt took over from Larry and Bill in 2011, they doubled down on expanding used-vehicle sales and service. "We aggressively price our cars," Emberton says. That has helped fuel growth in an underserved used-vehicle marketplace. Locations: Gates Chevy World, Mishawaka, Ind. ; Gates Toyota, South Bend, Ind. ; Gates Downtown South Bend (used only); Gates of Granger (used only), Granger, Ind. That dovetails with low-priced service to attract new customers who tend to be younger and more price-conscious. Gates offers $9.95 oil change-lube deals at all four sites. "And we sell tires at cost," says Dennis Pynaert, fixed operations manager for all Gates stores. "We deal with a lot of starting-out buyers who don't have a lot of money for service. We're fair on pricing because we're building our customer base." The low-pricing strategy requires more volume to work, but the company is growing. Gates' new- and used-vehicle sales almost doubled since 2009 to 5,000-plus last year, Emberton notes. Used volume was twice as high as new sales last year, but in 2009, it was more new than used, he adds. The four stores generated $13 million in service revenue on 90,000 customer-pay transactions in 2014, Pynaert says. "If we're both friendly and fair, we have a double shot at keeping customers," he adds. As equal partners, Joel and Matt split duties most days but cover for each other as needed. Matt handles Chevy World and Joel the Toyota store. Joel also takes care of used-vehicle acquisitions outside trade-ins and in-store purchases, mainly through online auctions. With the 2013 Granger store launch behind them, the two are fine-tuning operations this year. The goals: Find better ways to share used-vehicle inventory companywide and stock variations to give each used lot more distinctiveness. "Just staying focused on our customers," says Joel. "It's what we do."